71% of tropical glaciers in South America are found in Peru and the ongoing increase in the average global temperature is causing their retreat in many areas, threatening livelihoods. 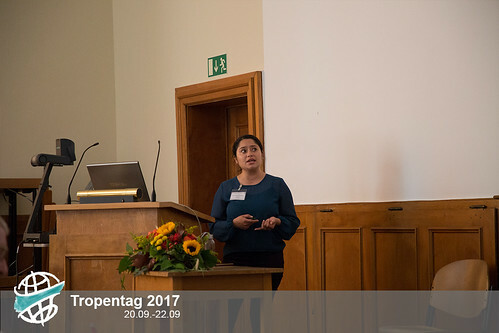 Yaremi Karina Cruz Rivera, from Cologne University of Applied Sciences, analyzed the perceptions of climate change of four communities living in the surrounding area of the Chicon glacier, one of the highest tropical glaciers in Peru, and the source of water for the Chicon Watershed. The four communities make use of the water in this area for human consumption and agriculture. The aim of the investigation was to assess the awareness of the communities, in particular of women, of the hazards linked to climate change. Results showed that people perceive that temperatures are increased and extreme climactic events such as droughts, floods and frosts have occurred frequently in the last decade, but drought is the most imminent challenge. The four communities demonstrated an awareness of the threat of climactic change to agriculture and their livelihoods, leading to an interest in implementing activities and ecological approaches, such as afforestation in the watershed together with the local government. At the oral sessions on cropping system and environment, Eike Luedeling reports about "potential fruit trees production decline induced by climate change". Eike Luedeling Temperate fruit trees need winter chill in order to produce fruits. The climatic requirements during the dormancy season are poorly understood. With raising temperature production is at risk. Adaptation planning is needed in order to maintain the production. 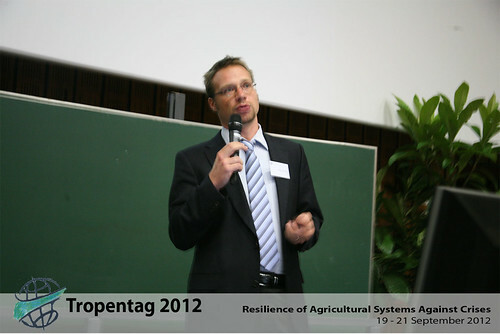 Eike Luedeling emphasizes the need for long-term adaptation strategies. He promotes the use of the dynamic model to consider climate change in cultivar selection and to find climate analogues. Climate Change: still getting hot! Nowadays, discussions about climate change are almost a guaranteed part of any scientific or academic forum. 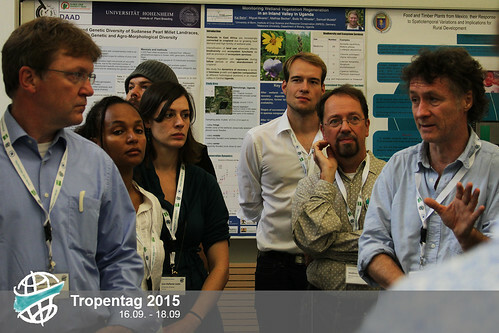 Tropentag 2011 is no exception. It is not only that climate change had one thematic session and two posters sessions dedicated to it, but the topic was constantly mentioned in other sessions such as Food Security, Ecosystem Services, Soil Fertility, Crop Production, Water and Irrigation, and Forests. I am not implying that climate change is THE ISSUE, but it seems clear that it was one of the key issues connecting the theme of marginality. If you follow the “whereabouts” of climate change (as I do! ), you won’t be surprise to hear that nothing really new came out the Tropentag 2011. Don’t get me wrong, there were lots of useful new data, nice climatic models, experimental results and adaptation activities; but they were in most cases, an improved version of what we saw in previous gatherings dealing with the issue -nothing really new-. Where the heat comes from? I was actually surprised to see that during the thematic session, the large lecture room was overflowing with people. 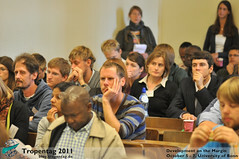 It was probably the most attended session apart from the plenary session on Wednesday 6 October, clearly indicating that visitors to Tropentag 2011 considered climate change as one of the hottest issues at the conference. A bit of background information about Prof. Lal Prof. Rattan Lal is a professor of Soil Science in the School of Environment and Natural Resources at the Ohio State University, USA. He has been involved in several activities both in research and teaching. He is a member of the U.S National Committee on Soil Science of the National Academy of Sciences (1998-2002) and (2007-to date). He is the lead author of the Inter-governmental Panel on Climate Change (IPCC) which earned him the Nobel Peace Prize in 2007. Read more about him at http://senr.osu.edu/facview.asp?id=382 Student reporter : What would be your take home message to someone who is not present here at the Tropentag 2011 conference? Prof. Lal : Several things depend on soil such as food security, water quality, climate change, production and biodiversity. Many ecosystem services which depend on soil are jeopardized because of poor soil management. Taking soils for granted has been the cause of many serious problems and we should avoid it. Student reporter : How can we achieve good production on marginal soils?